The food systems that humans depend on for survival follow the same paths and rules as all ecological food chain. All food chains conform to both the first and second laws of thermodynamics. and ecological influences can have a significantly effect on the global food supply. In this unit we will look at the global food supply and how agriculture exerts a set of impacts upon the environment. ​This unit is a minimum of 6 hours. The sustainability of terrestrial food production systems is influenced by sociopolitical, economic and ecological factors. Consumers have a role to play through their support of different terrestrial food production systems. The supply of food is inequitably available and land suitable for food production is unevenly distributed among societies, and this can lead to conflict and concerns. Which strengths and weaknesses of the systems approach and of the use of models have been revealed through this topic? To what extent have the solutions emerging from this topic been directed at preventing environmental impacts. limiting the extent of the environmental impacts, or restoring systems in which environmental impacts have already occurred? What value systems are at play in the causes and approaches to resolving the issues addressed in this topic? How are the issues addressed in this topic relevant to sustainability or sustainable development? 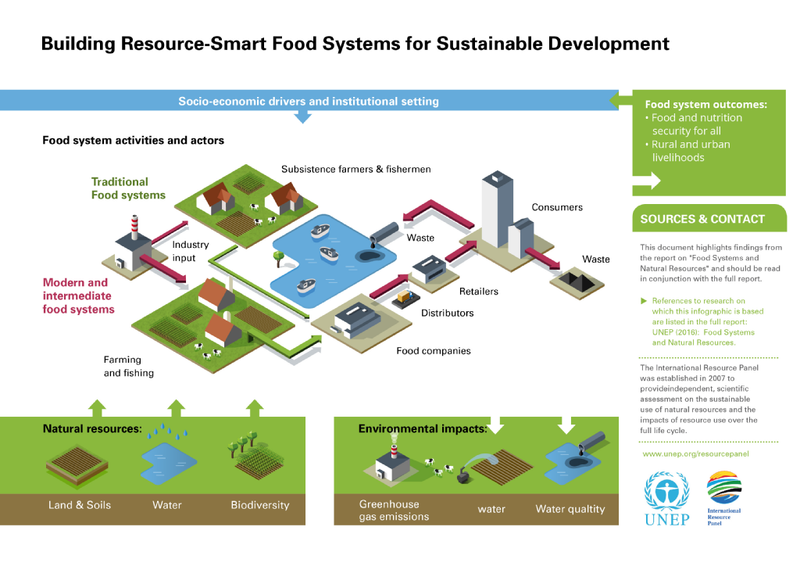 How can systems diagrams be used to show the impact of farming methods on natural systems? What are the limitations of such diagrams? How can the choice of farming systems prevent environmental impacts, or limit the extent of environmental impacts? How do EVSs influence the choice of farming systems? What are the issues relating to sustainable terrestrial food production? Is sustainable agriculture possible? 5.2.U1 ​The sustainability of terrestrial food production systems is influenced by factors such as scale; industrialization; mechanization; fossil fuel use; seed, crop and livestock choices; water use; fertilizers; pest control; pollinators; antibiotics; legislation; and levels of commercial versus subsistence food production. At the same time, many other factors are having severe impacts on food production: water stress and desertification is reducing the amount of arable land; many pests are becoming resistant to insecticides, but many of the most effective chemical agents are now banned under environmental regulations; underdeveloped infrastructure means that losses increase further during transport and storage; consumption patterns are changing and developing nations such as India and China have an increased appetite for meat, and climate change is bringing new microbial diseases to food-growing regions along with more extreme and unpredictable weather patterns. Increases in global populations and changes in diet have put pressure on terrestrial food production systems. Arable land is becoming limited due to increasing human settlements and urbanization. Soils are becoming degraded through intensive farming. Increased agriculture has led to the loss of biodiversity as native habitats have been cleared. The United Nations Food and Agriculture Organization estimates that nearly 870 million people of the 7.1 billion people in the world, or one in eight, were suffering from chronic undernourishment in 2010-2012. Almost all the hungry people, 852 million, live in developing countries, representing 15 percent of the population of developing counties. 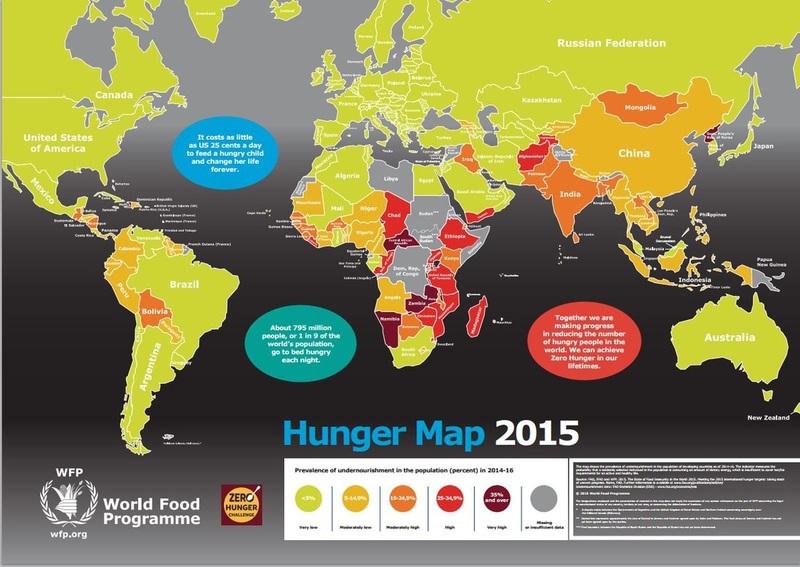 There are 16 million people undernourished in developed countries. Chronic under-nourishment, during childhood leads to permanent damage: stunted growth, mental retardation, and social and developmental disorders. Many are also suffering from malnutrition (enough energy but not enough essential nutrients). 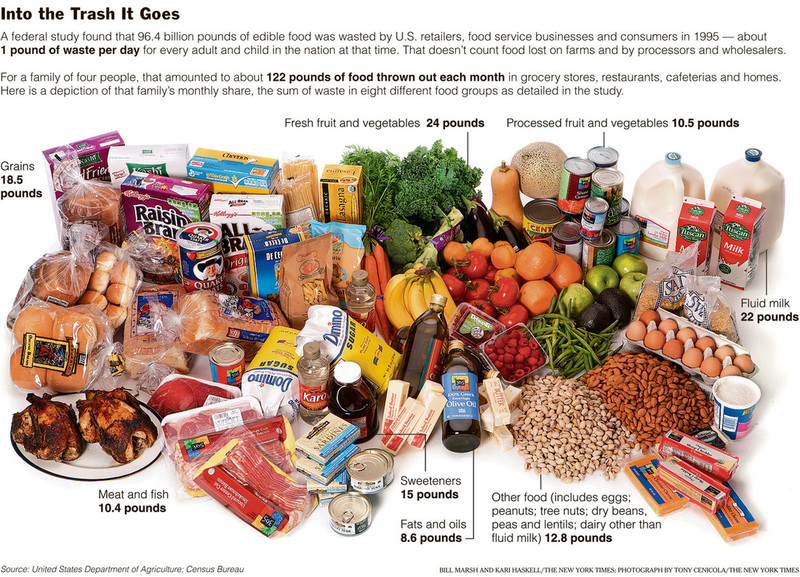 In many MEDCs, the cost of food is relatively cheap and people choose food based on preference not nutritional need. Seasonal foods have almost disappeared as foods are readily available all year round. 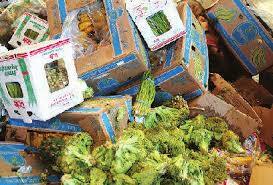 Modern technology and transport systems mean that foreign foods can be bought in almost any market. In LEDCs, many populations struggle to produce enough food to sustain them. Arable land is scarce. There may also be political agendas as well as simple environmental limitations on food production. Crops that are grown are often exported for profit (cash cropping) and not for the local communities. Arable land is in finite supply. 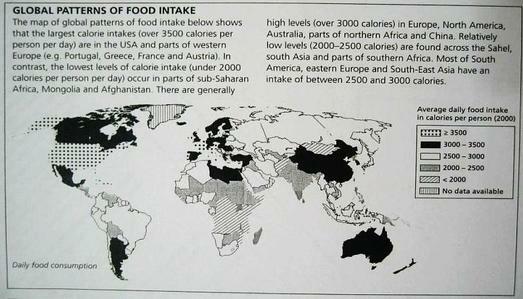 There are large differences in food production in the world but distribution is the problem. Countries like USA, Canada, and Australia produce more food than they need but who should pay for it to be distributed to poorer countries in need such as Bangladesh, Sudan and Ethiopia. The political angle attached to this means that perhaps the receiving country maybe in the others debt, and prone to exploitation. Who decides who gets this food? These are issues that revolve around the topic of food distribution. The diets of MEDCs and LEDCs, differ as well. MEDCs average calorie intake is about 3314 whereas LEDCs is only about 2666 per day. As we adapt more and more of the net primary productivity on Earth to human needs, use and degrade more land, demand more meat, we must be reaching our limits. Agriculture in the LEDCs are in contrast and have low levels of technology, lack of capital and high levels of labour." 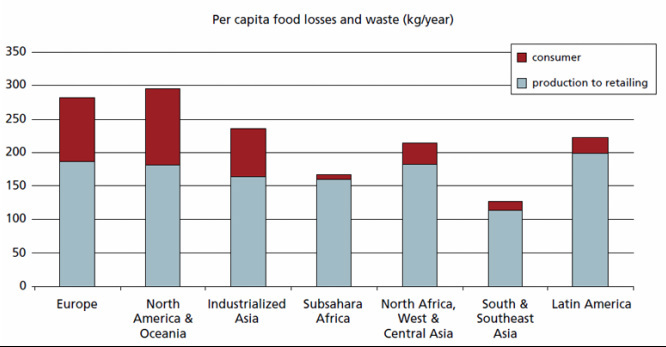 5.2.U3 Food waste is prevalent in both LEDCs and more economically developed countries (MEDCs), but for different reasons. As countries develop and consumption increases so does the amount of waste per capita, and pollution becomes a greater problem. There are global, national and local strategies in place to reduce levels of waste and minimize impact on the environment. The amount and type of waste produced varies between countries. MEDCs have higher levels of consumption, so many produce more waste than LEDCs. Ireland and the USA produce over 700 kg of waste per person per year. In LEDCs the figure is around 150 kg per person per year. This difference is due to different levels of consumption; it is also more common to reuse items in LEDCs. As a country becomes more wealthy, the demand for consumer items increases. This means that items are replaced more frequently - leading to larger quantities of waste. For example, mobile phones and computers that still work may be discarded for a newer version. Social influences on food intake refer to the impact that one or more persons has on the eating behavior of others, either direct or indirect, either conscious or subconscious. The relationship between low socio-economic status and poor health is complicated and is influenced by gender, age, culture, environment, social and community networks, individual lifestyle factors and health behaviors. There are clear differences in social classes with regard to food and nutrient intakes. Low-income groups in particular, have a greater tendency to consume unbalanced diets and have low intakes of fruit and vegetables. Education level and income determine food choices and behaviors that can ultimately lead to diet-related diseases. The origins of many of the problems faced by people on low incomes emphasizes the need for a multidisciplinary approach to targeting social needs and improving health inequalities. 5.2.U5 As the human population grows, along with urbanization and degradation of soil resources, the availability of land for food production per capita decreases. Most food chains do not have a fourth or fifth trophic level, because energy is not sufficient to sustain fourth or fifth trophic level. As you progress a trophic level only a percentage is passed on to the next organism (approximately 10%- as a result of the energy required to maintain homeostasis), so it would not be efficient to eat an animal that would give you a small biomass. More people on Earth could be supported for a given area of land farmed if individuals eat lower on the food chain. Eating primary producers instead of eating herbivores could support the same number of people as at present, but with less land degradation because we wouldn't need to have so much land in production. These consequences of a change in our diets result from the basic thermodynamic principles outlined above. The UN's Food and Agriculture Organization (FAO) estimates that ~ 30% of the ice-free land surface area of Earth is directly or indirectly involved in livestock production! Not as much land and other resources raising grain to feed to animals. Overgrazing on public and private range lands could decrease. 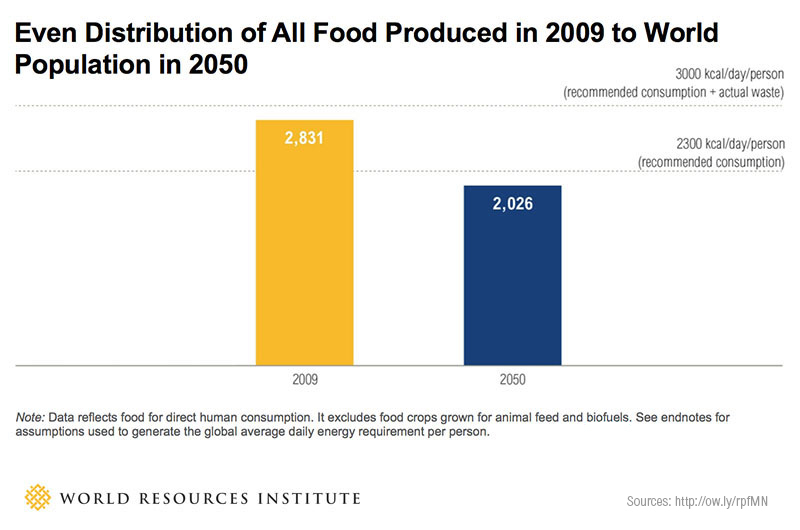 Less fossil fuel energy (and associated emissions of CO2) would be required to produce our food. 5.2.U7 Cultural choices may influence societies to harvest food from higher trophic levels. ​Most food is harvested from low trophic levels (producers and herbivores). Systems that produce crops are more energy efficient then those which produce livestock. This is because energy is greater in proportion in the low trophic levels. Even though it is efficient to use arable systems, many cultures still use livestock as part of their farming system. Taste and cultural demand play a major role in this and the animals also provide a source protein which is essential for the human diet. Animals are also used as working animals in some cultures. 5.2.U8 Increased sustainability may be achieved through: altering human activity to reduce meat consumption and increase consumption of organically grown and locally produced terrestrial food products, improving the accuracy of food labels to assist consumers in making informed food choices, monitoring and control of the standards and practices of multinational and national food corporations by governmental and intergovernmental bodies, planting of buffer zones around land suitable for food production to absorb nutrient runoff. 5.2.A1 Analyse tables and graphs that illustrate the differences in inputs and outputs associated with food production systems. 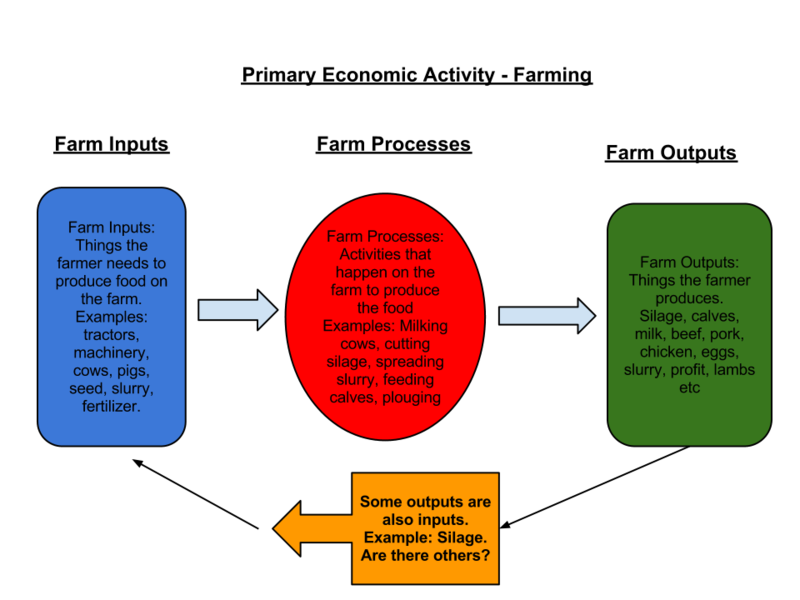 5.2.A2 Compare and contrast the inputs, outputs and system characteristics for two given food production systems. The systems selected should be both terrestrial or both aquatic. In addition, the inputs and outputs of the two systems should differ qualitatively and quantitatively (not all systems will be different in all aspects). The pair of examples could be North American cereal farming and subsistence farming in some parts of South‑East Asia, intensive beef production in the developed world and the Maasai tribal use of livestock, or commercial salmon farming in Norway/Scotland and rice‑fish farming in Thailand. Other local or global examples are equally valid. socio-economic factors - arming for profit or subsistence, for export or local consumption, for quantity or quality; traditional or commercial farming. This intensified farming e the 1940′s with the aim of producing cheaper meat has led to habitat loss as they have been removed to make bigger fields and cases of Eutrophication have increased as excess use of fertilizers and large amounts of slurry produced in the system enter water courses. Fear of causing antibiotic resistance in human bacteria through bioaccumulation. during drought times Himba cattle compete with wild grazers for food this can lead to soil erosion as well as food shortage (environmental impact)"
Compare and contrast these in terms of their trophic levels and efficiency of energy conversion. There is no need to consider individual production systems in detail. In terrestrial systems, most food is harvested from relatively low trophic levels (producers and herbivores). In aquatic systems, perhaps largely due to human tastes, most food is harvested from higher trophic levels where the total storages are much smaller. Although energy conversions along the food chain may be more efficient in aquatic systems, the initial fixing of available solar energy by primary producers tends to be less efficient due to the absorption and reflection of light by water. The Second Law of Thermodynamics states that energy goes from a concentrated form (like the sun) to a dispersed form (like heat), the availability of energy to do work therefore diminishes on the system becomes increasingly disorder. It explains how energy transformations in living systems can lead to loss of energy from the system. The order in living systems is only maintained by constant input of new energy from the sun. 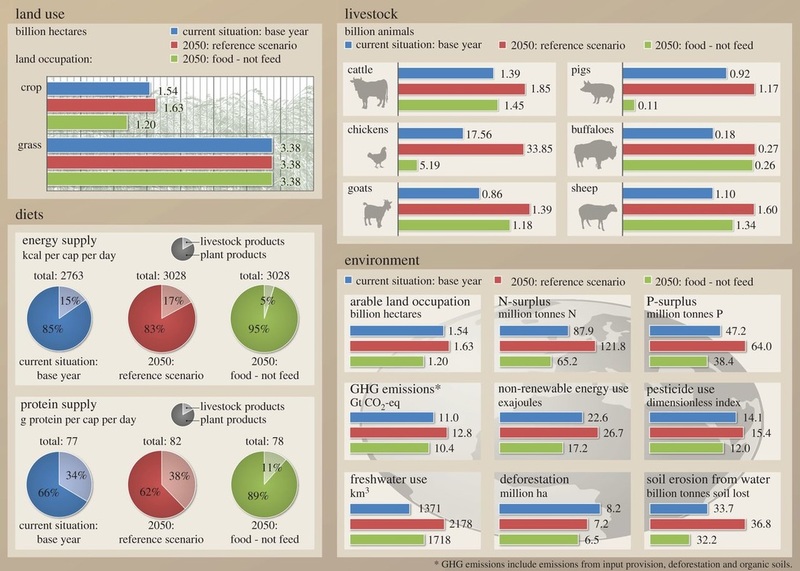 5.2.A3 ​Evaluate the relative environmental impacts of two given food production systems. Factory farming reduces the amount of land needed for meat production, however, these farms are a serious air and water pollutant. The waste of these animals ends up in the nature and poses a constant risk of drinking water contamination and seriously affects the air quality of the nearby areas. One solution for the problem with animal waste lays in its use for production of biofuel which can then be used for production of electricity but this practice is the exception rather than the rule. Mass meat production has shown main contributors to carbon dioxide emissions which in turn are the main cause of the climate change. The meat industry is estimated to be responsible for about 9 percent of total carbon dioxide emissions which are a result of emissions of various gases from the farms as well as from the microbial activities after application of animal waste as fertilizers. Animal husbandry poses a serious threat to the local ecosystems and biodiversity due to the use of the land for grazing and animal feed production. As much as one quarter of the Earth’s surface is used for grazing and about one third of arable land is used to produce animal feed. As a result, the wildlife species struggle with lack of habitat, while some are even threatened with extinction. 5.2.A4 Discuss the links that exist between sociocultural systems and food production systems. This could be illustrated through the use of examples, such as: the way in which the low population densities and belief systems of shifting cultivators links with the ecosystem of “slash and burn” agriculture; the relationship between high population densities, culture, soil fertility and the wetrice ecosystem of South‑East Asia; the link between the political economy of modern urban society, corporate capitalism and agro-ecosystems. There are many factors that come into consideration as to the method and level of sustainability of food production methods. Population density/size, culture, soil fertility, and method of agriculture are some of these factors. Shifting cultivation is an agricultural system in which plots of land are cultivated temporarily, then abandoned and allowed to revert to their natural vegetation while the cultivator moves on to another plot. The period of cultivation is usually terminated when the soil shows signs of exhaustion or, more commonly, when the field is overrun by weeds. The length of time that a field is cultivated is usually shorter than the period over which the land is allowed to regenerate by lying fallow. Of these cultivators, many use a practice of slash-and-burn as one element of their farming cycle. Others employ land clearing without any burning, and some cultivators are purely migratory and do not use any cyclical method on a given plot. Sometimes no slashing at all is needed where regrowth is purely of grasses, an outcome not uncommon when soils are near exhaustion and need to lie fallow. One land-clearing system of shifting agriculture is the slash-and-burn method, which leaves only stumps and large trees in the field after the standing vegetation has been cut down and burned, its ashes enriching the soil. Cultivation of the earth after clearing is usually accomplished by hoe or digging stick and not by plough. 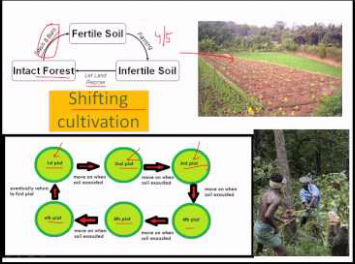 5.2.A5 Evaluate strategies to increase sustainability in terrestrial food production systems. BBC: Could Insects be the Wonder Food of the Future? Where does our food come from. Interesting interactive map. ​​​​Correct use of terminology is a key skill in ESS. It is essential to use key terms correctly when communicating your understanding, particularly in assessments. Use the quizlet flashcards or other tools such as learn, scatter, space race, speller and test to help you master the vocabulary. 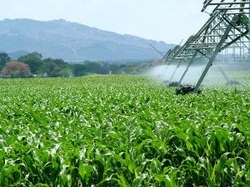 African Farmers Grow Trees As A Natural Crop Fertilizer - Christian Science Monitor 2 May 2012. Food choices can be influenced by culture, religion or regional food production differences. Consumer behaviour plays an important role in food production systems—are there general laws that can describe human behaviour? 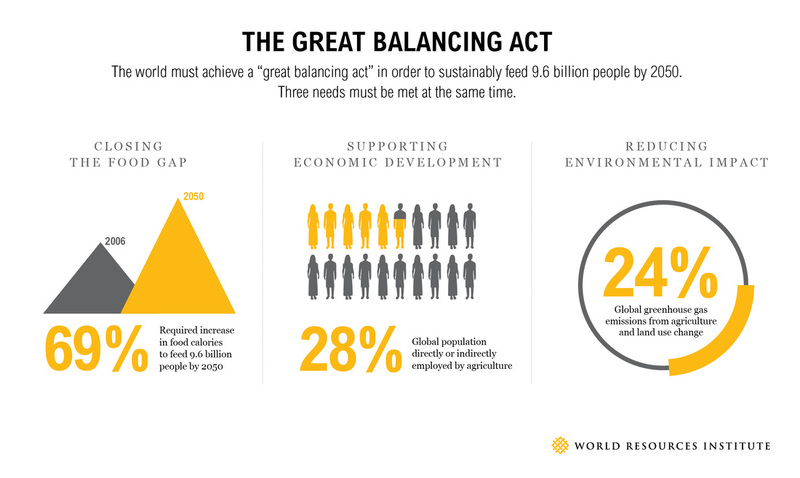 By 2050 there will be 9 billion people on the planet - but will there be enough food for everyone? 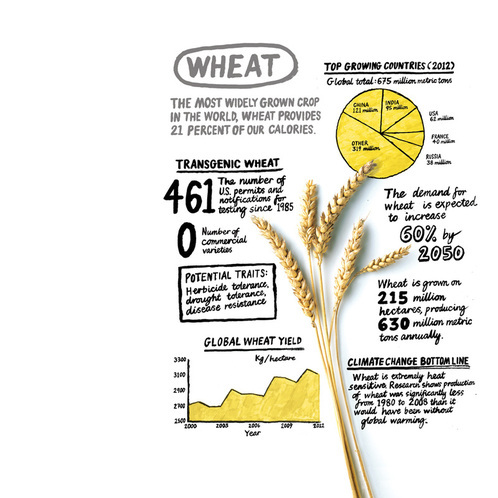 Food security expert Dr Evan Fraser guides you through a whiteboard presentation of his solution to the Global Food Crisis. By empowering countries to grow their way out of poverty, we can break the cycle of hunger and build a more stable world for future generations. A great movie about understanding how our food supply system works and how we can make better decisions about food. The future of our world depends on addressing global challenges now. We need to create sustainable livelihoods, feed a growing population and safeguard the environment. We need to make the global economy green. Fair Trade is about helping small family farmers in developing countries get organized and develop their business skills in order to tap into the world market directly. ​How Much Does Meat Actually Cost? Adam Henson travels to the USA to learn about what intensive dairy and pig farming means -- for the animals and for the environment. The movie that started it all! The Meatrix spoofs The Matrix films and highlights the problems with factory farming. In this presentation, Jonathan Foley shows how agriculture and land use are maybe a bigger culprit in the global environment, and could grow even larger as we look to feed over 9 billion people in the future.